The holiday season has inspired some Youngstown State University students to give back to their communities. Students are volunteering their time at animal shelters, rescue missions, churches, hospitals and more in hopes of giving others a brighter holiday season. Jenna Pavlansky, a senior psychology major, said she continually volunteers at St. Charles Borromeo Catholic Church in Boardman, Ohio. Pavlansky said during the holidays, the church organizes a giving tree in which members of the church will choose a name and purchase a gift for that individual. Members of YSU sororities and fraternities are required to complete a mandatory number of volunteer hours. Veronica Hall, a junior communications major and an alumni of Alpha Omicron Pi, said each member was allowed to choose what they wanted to volunteer for. In Hall’s opinion, volunteering is a great way to give back to the many people in Youngstown who are less fortunate. Nicole Kent-Strollo, director of Student Outreach and Support at YSU and chair of the Salvation Army Advisory Board in Mahoning County, said she assists several groups with volunteer opportunities. “I believe volunteering provides us with a unique opportunity to identify and pursue our passions,” she said. Kent-Strollo assists the athletic department with volunteering and said some athletes volunteer with the Salvation Army to collect donations. “Over the past several years, our YSU student athletes, student organizations, faculty, staff, coaches, administration and alumni have helped raise thousands of dollars in critical funds,” she said. El-Hayek said it’s important everyone feels included in something, and she thinks the dinners provide unity as well as a place for students to socialize with one another. 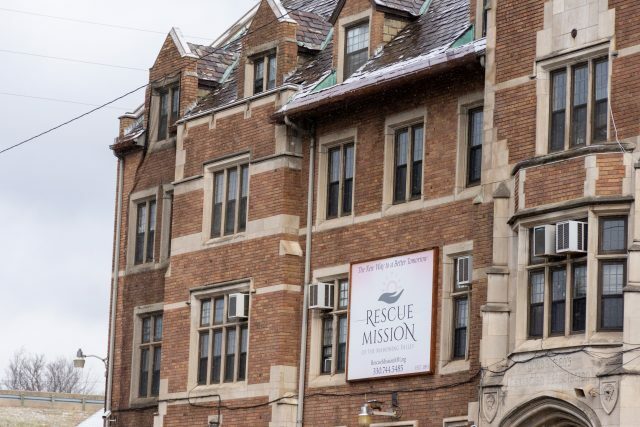 Halle Van Scoy, a junior finance major, said she volunteers at New Lease on Life Animal Shelter in Struthers, Ohio, and mentioned volunteers play an important role for the shelter. Van Scoy said an adoption event, including cats, dogs and rabbits, was held last year around Christmas on a tree farm. Hall said volunteering is a humbling experience. Volunteers at this animal shelter can walk dogs, play with and interact with the animals. Located at 4140 Market St. in Boardman, Ohio. Volunteers at this animal shelter can walk dogs, work adoption events and care for the animals. Located at 2773 E. Midlothian Blvd. in Struthers, Ohio. Volunteers can serve meals, babysit children, organize a project and tutor. Located at 962 Martin Luther King Jr. Blvd. in Youngstown, Ohio. Volunteers can organize outings, spend an afternoon with residents and participate in activities. Located at 335 West McKinley Way in Youngstown, Ohio. Volunteers can answer telephones, deliver flowers, restock closets and change linens. Located at 1044 Belmont Ave. in Youngstown, Ohio.